Sections: Who Is Sumner Redstone & Why Should We Care? | Who Gave the Airwaves Away? | Welcome to The Revolution? | But What About The First Amendment? | What Happened to the News? Robert W. McChesney is the Gutgsell Endowed Professor in the Department of Communication at the University of Illinois at Urbana-Champaign. In 2002, he co-founded Free Press, and served as its president until April 2008. McChesney hosts the Media Matters weekly radio program every Sunday afternoon on NPR-affiliate WILL-AM. McChesney has written or edited 17 books. His most recent books are The Political Economy of Media and Communication Revolution. Mark Crispin Miller is a professor of media studies at New York University, where he also directs the Project on Media Ownership. His writings on film, television, advertising and rock music have appeared in numerous journals and newspapers, including The Nation and The New York Times. In 1988, he published his first book, Boxed In: The Culture of TV, followed by Seeing Through Movies, Mad Scientists: The Secret History of Modern Propaganda, Spectacle: Operation Desert Storm and the Triumph of Illusion, and The Bush Dyslexicon. His newest book is Cruel and Unusual: Bush/Cheney's New World Order. "[Opens] up questions of ownership and conglomeration. 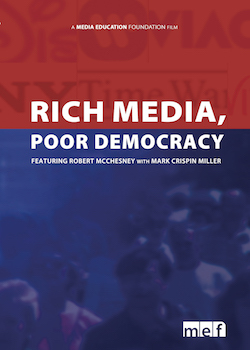 Would serve as a solid introduction to any course on media criticism."